The Valentine's day collection is made up of beautiful Valentine-y shades! I've not tried Top Shelf Lacquers before, so I was happy for the opportunity to review these. 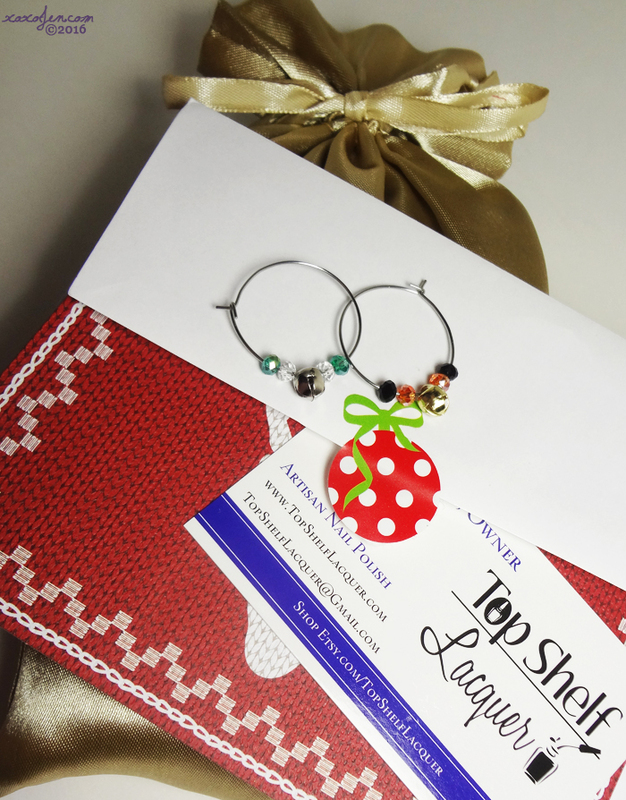 The packaging is cute - little bottles all bundled up in a satin drawstring bag along with wine glass charms, a business card and handwritten holiday card. I was sent several of the shades, but not all of them so do look around other blogs or join the facebook fan group to see them all! These shades will be available only at The Top Shelf shop on January 15, at 7:00pm Central time. I was pleasantly surprised at how well behaved this white polish was! Super creamy not streaky at all and quite opaque. I wore this for nearly a week with no chips or tipwear. The thicker of this group, but not unmanageable. A coat of QDTC helped smooth it right up. Heh, puch is a good name for it, so bright it packs a punch! A fun color and quite squishy almost a jelly but too opaque to be called one. I couldn't decide if this was a warm or cool toned red it looked like both depending on lighting! Shrinking Violet Cocktail - A deep eggplant purple linear holo. What a grape color and my fave of the bunch! (see what I did there?) Still wearing it today and planning to wear it for a few more! 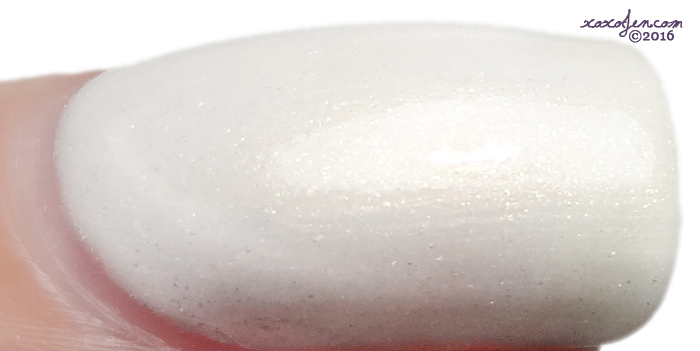 I wore two coats of each polish and found the formulas on all of them were easy to apply and streak free - yes even the creamy white shade, The French Kiss! Cupid's Float (pale pink) was the thicker of the bunch but it wasn't unmanageable. The other pinks and reds are squishy and apply like a dream and that purple! But you guys know me, I always love the purple! Thank you for visiting and reading, if you enjoyed my post please follow my facebook page to see what I post next! Those are some pretty colors for Valentine's Day. I like the nail art designs you created with them a lot too. Thank you! 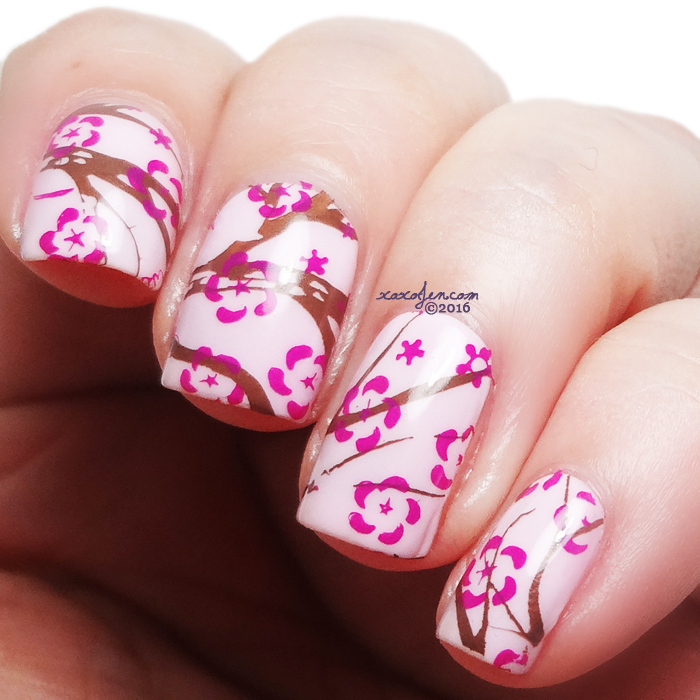 I had fun doing the nail art. Beautiful colors! I haven't tried this brand yet. I'm happy with it, although I think I would get full size if making a purchase. The minis brush stem is pretty short and I had a little difficulty painting. Probably because I don't ever use / buy minis so this was new to me. I really, really like the red creme. I am a sucker for a good red creme, this looks amazing. Top Shelf has been putting out some excellent colors lately! Definitely an awesome red cream! I will be watching Top Shelf launches more closely now! Gorgeous colors, your swatches are perfection!! 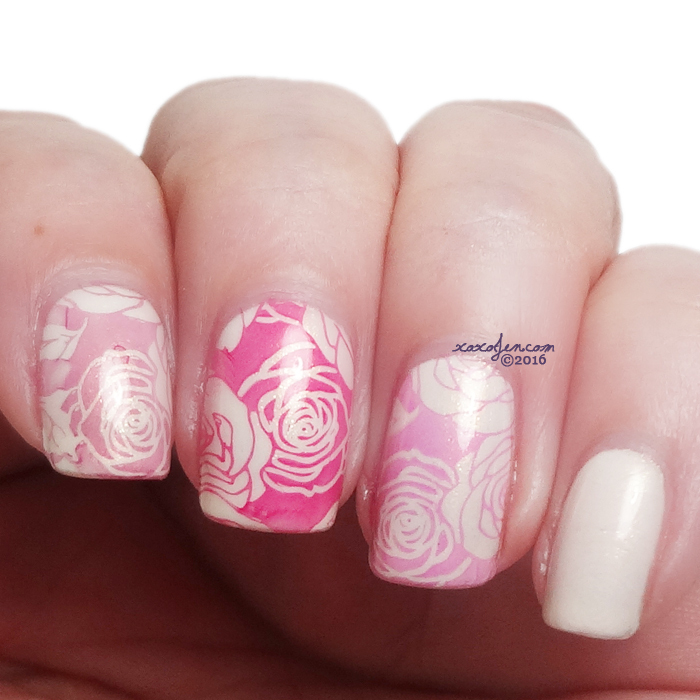 I love it when cremes end up stamping as well! Def a plus in my book. Right!? It's exciting to discover those! Lady in Red Cocktail is amazing!!! Isn't it though? I am not much of a red lover but I love that one! Lady In Red Cocktail and Violet Shrinking Cocktail are my absolute favorites!